﻿ Meniere's disease how to diagnosis, what are the treatments? Meniere’s disease is a common condition that can be crippling due to the consequences of the vertigo on the patient’s work, family and social life. This syndrome has a wide variety of causes and a very particular triad of clinical symptoms (dizziness, deafness, tinnitus). The progression of the condition is very unpredictable. 1) The onset of significant rotational vertigo requiring the patient to lie down and accompanied by intense neurovegetative signs: nausea, vomiting, sweating, diarrhoea. The dizziness lasts 2 to 3 hours and leaves the patient feeling exhausted. After the episode, the patient may feel inebriated. • tinnitus causing a non-pulsating buzzing, whistling or humming sensation. • perceptive deafness, which, at first, is predominant in low frequencies and fluctuates enormously. This is also accompanied by the feeling of having a blocked ear, fullness or pressure that wanes after an acute attack. As the condition progresses, the deafness worsens, affecting all frequencies, and reaches a hearing loss plateau of 50 to 70dB. This is accompanied by endocochlear signs: apperception impairment, intolerance to loud noises, diplacusis and sound distortion. 3) Predisposing factors: patients often have a specific psychological background that includes stress, anxiety, fatigue and emotional trauma. In general the patients are perfectionists, intelligent and obsessive. 4) Disease progression: the disease’s progression varies greatly. The frequency of the vertigo is unpredictable and varies from one patient to another. It can vary from one to two episodes per week or per month or the vertigo may occur only once a year or every two years. This differs depending on whether the patient is examined during or between episodes. During an episode, the examination using VNG shows a nystagmus with all the characteristics of a peripheral nystagmus. This nystagmus is typically horizonto-rotational and its frequency or extent is reduced when the gaze is fixed. It is widely accepted that the eye movement changes direction during the episode: first of all in the rapid phase the movement is directed towards the affected ear (“irritative nystagmus”) then changes direction towards the healthy ear (“destructive nystagmus”). Finally, at the end of the episode, the rapid phase movements may be once again directed towards the affected ear (“recovery nystagmus”). It is therefore often impossible during the episode, merely with the nystagmus, to ascertain which ear is affected. Auditory signs are actually the only symptoms that can locate the problem. This tests for the three essential characteristics of deafness: deafness fluctuates from one examination to another, it is perceptive and often has an upward curve at the beginning, affecting low frequencies up to 1 Hz. As it progresses, the deafness becomes horizontalized and affects all frequencies. 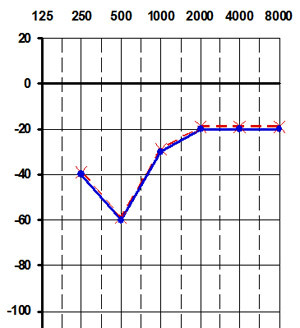 Sometimes the audiometric curve is downward sloping, mainly affecting high frequencies. In practice, the pure tone audiogram is by far the best examination to detect Meniere's disease. Ascending or plateau deafness confirms diagnosis. Its main advantage is that it demonstrates a strong recruitment of loudness, i.e. endocochlear deafness: the stapedial reflex threshold is normal (around 85 dB) regardless of the hearing loss. Caloric tests are used to assess the functioning of the ampulla of the horizontal semicircular canal at low frequencies. They measure vestibular reflectivity. Reflectivity during unilateral tests (i.e. the responsiveness of a vestibule to irrigation of the external auditory canal with hot or cold water) is often normal in the beginning. The hypovalence is less than 20%. During the course of the disease, hypovalence occurs on the affected side in 50-70% of cases. Vestibular areflexia is exceptional, and occurs late in the disease in 5-10% of cases. These tests provide further information on the functional state of the ampulla of the horizontal semicircular canal at medium frequencies. 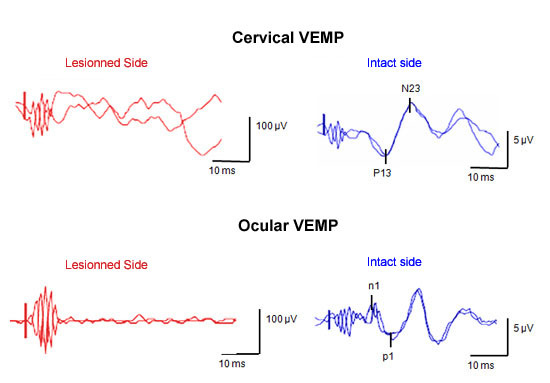 Evoked myogenic potentials (Vemp) induced by strong sound stimuli (clicks or short tone bursts) received in the cervical area or eyes. This test provides information about the functioning of the saccule and sacculo-spinal pathways (cervical test) or utricle (eye test). In Meniere's disease, at the start, saccular and utricular responses are usually normal, but they may then disappear. The physiopathogenesis of this disorder, first described in 1861 by Prosper Meniere, is still debated. It is likely to result from abnormal functioning of endolymph absorption mechanisms, especially those located in the endolymphatic sac. This would lead to endolymphatic hydrops, a distension of the membranous labyrinth, which is the histopathological stigma of the disease. Some acquired forms of endolymphatic hydrops are distinguished from idiopathic Meniere's disease. Schucknecht has described this condition appropriately: these are patients with profound unilateral sensorineural hearing loss induced by infection or trauma, who, after a lapse of time, suffer from episodes of vertigo associated with vestibular dysfunction on the side of the hearing loss or fluctuating deafness alternating with vertigo stemming from a problem with the inner ear. The diagnosis is based on physician-patient discussion. Treatment of the vertigo episode is based on patient isolation and administering vertigo medication, a sedative and/or an antiemetic. Constitutional treatment is aimed at preventing a recurrence in vertigo and is subdivided into conservative, destructive, medical or surgical treatment, according to whether they preserve or destroy the patient’s vestibular function. Conservative treatments are basically designed to reduce the sensitivity of the vestibular system. Various drugs such as antihistamines, calcium antagonists or vestibular suppressants are used over long periods. Other drugs are aimed at reducing endolymphatic hydrops (glycerotone, mannitol, diuretics). A sodium-free diet is commonly prescribed. The patient’s general state must also be considered: it is important to talk to patients to help them accept their illness, prescribe anxiolytics, etc. Destructive treatments serve to destroy the vestibular receptors (chemical or surgical labyrinthectomy) or to section the vestibular nerve (vestibular neurotomy). If the patient is refractory to medical treatment and continues to suffer from frequent vertigo, a chemical labyrinthectomy can be proposed. This is performed by intratympanic injections of an ototoxic antibiotic, gentamicin sulphate, under local anaesthesia. The number of injections varies between one and six depending on the patient and must be given one week apart. Hearing is totally preserved. The destruction of dysfunctional vestibular receptors cures the patient’s vertigo permanently. Central vestibular compensation takes place the first week following the effect of the gentamicin sulphate. This treatment must be administered by following the progression by videonystagmography and otolithic evoked potentials. The EquiTest is used to see how well balance function has been restored. Meniere's disease how to diagnosis, what are the treatments?